There’s a specific order I follow for blending, to avoid food getting stuck: Break banana into two pieces, add to blender (TIP: if you freeze your bananas, it’s helpful to break them up before they go in the freezer). Add milk. Add peanut butter. Add cinnamon. Throw the greens on top, add ice over that. Blend on high for several minutes or until desired consistency. Pour into glass and enjoy! You can also add a smidge of coconut oil in with the peanut butter. Green smoothies are great because you can make them any way you want, with any liquid, any fruit, any green, any added protein, etc. 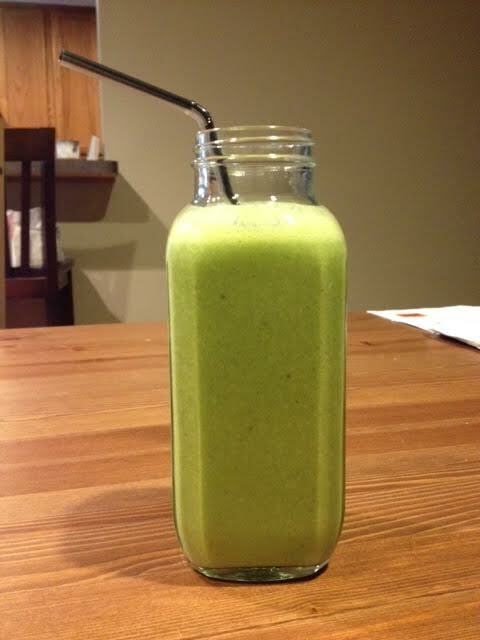 This smoothie gives you protein and possibly several servings of vegetables for the day! It fills me up for 3-4 hours. Crack eggs into a bowl. Add salt and pepper, whisk. Set aside. Add oil of your choice to a pan that has been sitting over medium heat on the stove top for several minutes. Let oil heat up for 1 minute. Add greens, and saute until wilted and half their size, about 2-3 minutes. Pour in egg mixture, making sure to cover all the greens. You may have to swirl the eggs around the pan. Cook until egg mixture begins to get white and stiff around the edges. Add grated cheese and scallions over the egg mixture. With a spatula, fold the egg mixture over to one side, making an egg envelope. Cook one side for 2 minutes, then flip and cook other side for about 3 minutes or until done. 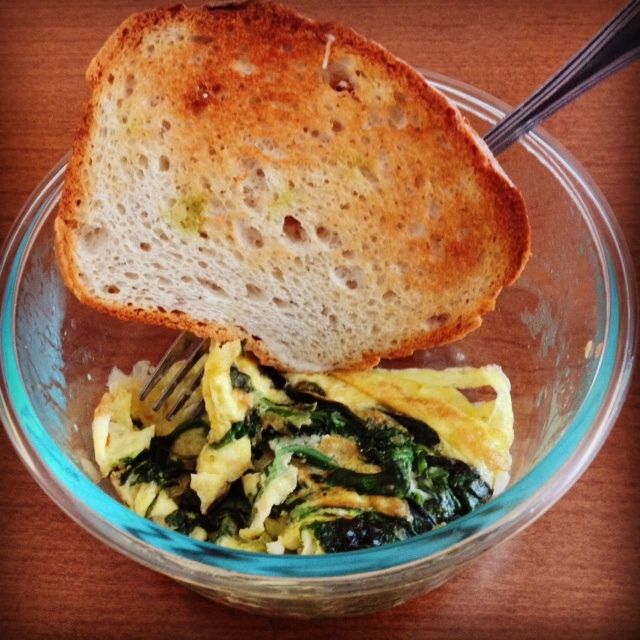 Serve with gluten-free bread (I enjoy Udi’s ). Pre-heat your griddle to high (or if using a pan, pre-heat over medium-high heat). Mix pancake batter and mashed banana together. Spread coconut oil (or oil of your choice) onto griddle/pan. Add 1/4 c. scoop of pancake-banana batter to griddle/pan. Sprinkle 3-4 chocolate chips on pancake. 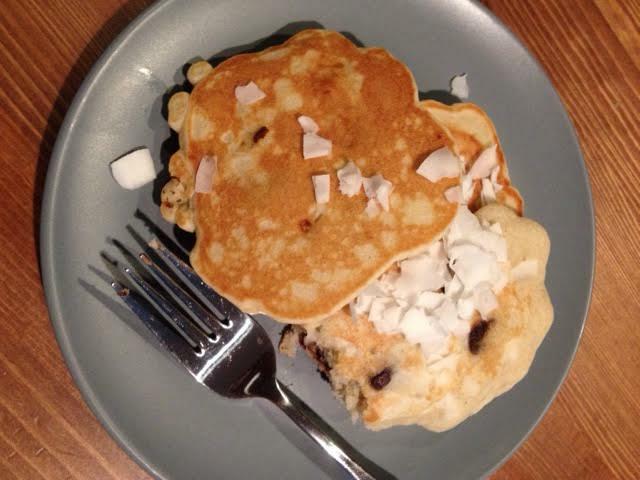 Sprinkle small amount of coconut onto pancake. With a small spoon, spoon a tiny amount of pancake mix from the bowl over the chocolate chips, and lightly pat with the spoon as well. Repeat until your griddle/pan has run out of room. By now, the first pancake should be ready to flip, but you’ll know for sure when the edges are stiff and “standing” slightly, meaning they do not appear liquidy anymore. If you need a time, my guess would be anywhere from 3-5 minutes, depending on your pan or griddle. Still unsure? Take a spatula and gently lift up one corner of the pancake. If you see golden brown bottom, they are ready to flip. Flip over, and cook another 2-3 minutes on the other side. Remove from griddle and consume! *NOTE: The mix I use is a little on the dry side, so instead of vegetable oil, I use coconut oil. Also, to keep low FODMAP, use lactose-free or dairy free milk in the mix (if your mix calls for it). One of my other breakfast staples is from Detoxinista. The grain-free pumpkin seed granola is AMAZING! It’s grain-free, all the nuts are suitable for low FODMAP, and it is so good with almond milk. I even add it to smoothies sometimes for extra protein. If you are avoiding dried fruit, simply leave it out of the recipe. It’s delicious without it! Again, low FODMAP really lends itself to be “breakfast friendly”, and with so many great choices, I can eat a different breakfast almost every day of the week! The Best Frosting to Celebrate Another Year!